We’re a technology company that understands the inherent complexities of businesses and with our technical expertise we help them transform and scale. To know more about our technical prowess and how we can help you get in touch with our experts. Being innovators at heart, we use the latest technologies to drive rapid digital transformation across your Government departments and agencies. Uneecops provides cutting-edge Microsoft Technologies to provide effective solutions to ministries, PSUs and other public figures. 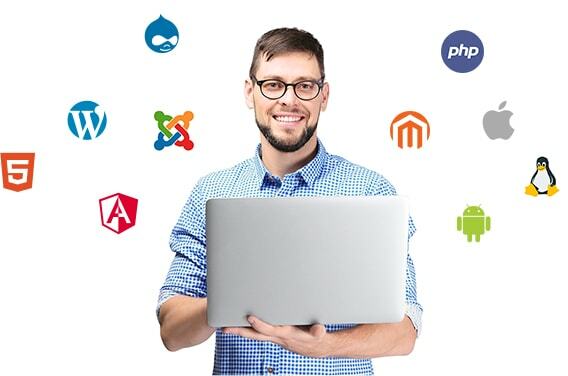 We use open source technology to deliver robust and scalable websites and applications with significantly lesser development costs and flexibility. Our experts develop feature-rich and engaging mobile apps that are close to your expectations. Our iOS and Android experts ensure that we make apps that make mobile governance possible. Whether it's modernizing existing website, developing mobile apps or streamlining communication with CMS, we help public sector organisations fulfil their missions and realize results faster. Joomla is the robust, scalable and enterprise-ready CMS applicable for diverse developmental issues. It has become as one of the world’s most preferred platforms due to its scalability and ease of use. Currently running at around 6 million downloads per year, Joomla is the ideal platform you would want to invest your efforts in. Trust Uneecops with your Joomla project and you will be amazed by the results. We have a wealth of expertise in Joomla and can facilitate enterprises with implementation, configuration and development of any kind or complexity. WordPress is an open source software you can use to create an intuitive website, blog or an application. Intuitive designs, robust features, and the freedom to explore anything you want. Moreover, you can extend this amazing CMS platform with over 45,000 plugins to help your website meet your needs. Effortlessly add an online store, forums, analytics, galleries, mailing lists and much more with this CMS and by working closely with Uneecops. PHP is the language of choice for web development with almost 80% of all the existing websites running live on PHP code. PHP Frameworks offer ready to use components, proven architecture, separation of model, view and controller logic (MVC paradigm). It provides most comprehensible, rich and intuitive design that makes it easy to work on. So, if you are looking for a flawless website with high performance and scalability, then PHP is the well-known framework that you would like to carry on. Our iOS experts know how to make feature-rich and engaging apps for the world’s most advanced mobile operating system. One of the main reasons to go for the iOS platform is its unmatched quality for its heightened user experience. In addition to the user interface and other features. iOS platform is known for its robust security features. Therefore, creating an iOS makes a perfect choice for creating a secure mobile app. We are leveraging scalability, flexibility & agility of the world’s most eminent and used mobile operating system. Our experts develop Android apps that are close to your specifications that work across all Android devices, regardless of screen size, OS version. With its maximum user adoption, Android is way easier to work with and make development relatively easier irrespective of any nature and complexity. Ensure success with robust features and functionalities which will help you stay ahead of the competition. Magento is an open source eCommerce platform which is gaining popularity worldwide. It is known for its incredible features and functionalities which is required for a typical success of any business. Uneecops exhibits hands-on experience in developing high-performing websites using Magento. With its scalability, extensibility, it is easier to deploy the website with excellence. Drupal is the leading open-source CMS among global enterprises, governments, higher education institutions, and NGOs. With this flexible platform, we enable the public sector to overcome delays and bottlenecks so that they can run pretty fast and create amazing experiences. Backed by one of the world’s most innovative open source communities, it is used by over one million organizations which include Economist, The White House, Harvard University, the Government of Australia, and Time Inc.
AngularJS enables developers to troubleshoot, share, and improve websites which makes it more efficient and provide cost savings to clients. Trust Uneecops with your project and you’ll not be disappointed. We have a rich experience in this technology and can assist with implementation, configuration, and development of any kind or complexity. Hibernate is an object-relational mapping tool which provides a framework for mapping an object-oriented domain model to a relational database. It also provides data query and retrieval facilities. Rely on Uneecops and see how with Hibernate we can solve your data related concerns. The Apache Tomcat software is released under the Apache License version 2. The Apache Tomcat project is intended to be a collaboration of the best-of-breed developers from around the world. We use this technology to empower numerous large-scale and mission-critical websites with its robustness, scalability and other critical features. Linux is an open-source software operating systems built around the Linux kernel. Typically, it is packaged in a form known as a Linux distribution for both desktop and server use. There are many reasons why Linux is generally preferred over proprietary software platform. Uneecops uses Linux for its extremely high-security capabilities and to avoid viruses and malware. Render your website with unique elements, attributes, behaviour and uncover new possibilities that powers most impressive, intuitive, enterprise-ready, robust, dynamic applications and websites. It enables you to develop the next level design of your websites that foster great engagement and render a fully functional website. Partner with Uneecops to uncover the possibilities with HTML. CMF enabled websites would immensely benefit citizens, businesses as well as Indian clients. With this CMF, users can easily navigate and search for the content they are looking for. Besides information, they can avail services at anytime and anywhere basis. Uneecops as your partner uses CMF enabled website so that you can reap the maximum benefits out of this. MySQL is undeniably the world’s most popular open source database. With its high-quality outcomes, reliability, and ease-of-use, it has become one of the leading database choices to be used by leaders such as Facebook, Twitter, YouTube and all eminent websites. Additionally, it is a high performing, reliable and easy to use open source database. Partner with Uneecops and discuss how we are leveraging technology to meet your exact business demands.